Yunga Tart’s policy: “A percentage of your purchase will go to charitably support improvement in the human condition.” We will not focus on any one cause, but will focus on those who are in need with an emphasis on those who use our type of products. Our goal is to exceed most large companies on a percentage of sales basis given to charitable causes. As part of our charitable endeavors, Yunga Tart has sponsored a Service Dog through Can Do Canines. Can Do Canines is an organization that trains and provides Service Dogs to assist people with physical disabilities. Yunga Tart is proud to be sponsoring Sullivan, an adorable yellow lab. Hero Healthcare Equipment Recycling’s mission is “To collect and redistribute donated healthcare supplies to help those in need.” Yunga Tart was able to make a donation of some of our products and Hero is distributing those products where they’ll do the most good. Hero ships recycled equipment world wide and we’re very happy that we were in a position to help. 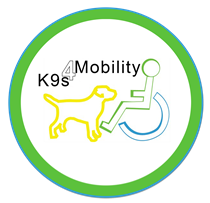 K9s 4 Mobility is a Cheyenne, Wyoming based organization that rescues dogs from shelters and trains them to be service dogs. We have been able to sponsor Gus, a chocolate lab that is currently being trained and will soon be helping someone to maintain their independence. “GoodHealthwill collects donations of durable medical equipment and healthcare supplies and provides them to the public thrift-store style.” We were able to support their cause by making a donation and hope to continue to work with them going forward. Good Health Will supplies medical equipment at very steep discounts to those in need.